“An Aquarian Exposition”. This is a scanned image of the original poster advertising the world famous Woodstock festival of 1969. “An Aquarian Exposition” is a reference to a belief of the time that the Earth was coming into the influence of the astrological sign Aquarius. Many thought this would usher in an age of peace, love and understanding. Woodstock posters were printed in two sizes 18″x24″ and 24″x36″. This being a scanned image, it is a 742x 1024 jpg and a 157 KB file and clearly represents the poster in it’s original condition. To find this image, I searched “original woodstock poster” in Google search. It was designed by Arnold Skolnick. He was contracted by fellow Woodstock Ventures and was hired on a Thursday and delivered the poster the following Monday. Even though countless amounts of money have been made from this poster, Arnold only received about 15$ in royalties. 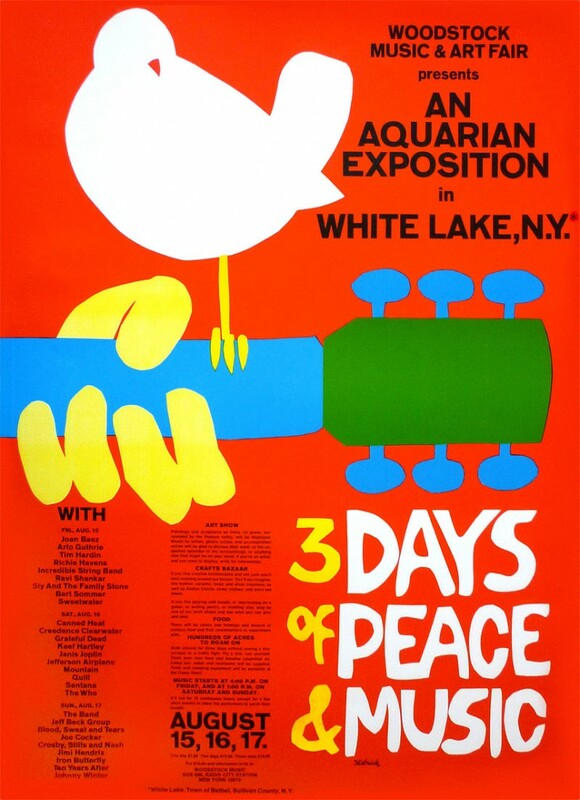 It is interesting that Arnold decided to create the poster in such a way that the words “3 Days of Peace and Music” are in the largest font. By doing this, he ensured that anyone interested in attending would first be attracted by the overall experience of the festival rather than a particular artist or band. I choose to use this image because music culture and how it is portrayed to society has always interested me. When analyzing this image and comparing it to that of more modern festivals, there is are very distinct differences. In modern day posters focus more on the performers, rather than the emotional experience that you will enjoy by attending. This poster in particular has been recreated quite a few times. One most mention-able is the attempted celebration of the 30th anniversary Woodstock festival. Of course, this was in no way as epic as the original festival. Even though many of the performers at the original Woodstock festival have pasted or broken up, their influence and names continue to reach new faces through this poster.